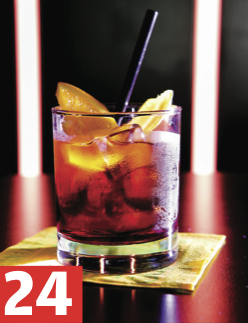 Unexpectedly, the almondy Amaretto Sour is the no.1 best-selling classic at four of the 100 bars we spoke to. Indeed, a third of bars said that it was sold regularly and was their top serve. As an approachable sweet-sour drink, it’s a crowd pleaser and also flexible enough for modern twists. Bourbon gives the drink a little more power, but in its original form it is two shots of amaretto, lemon juice and egg white, while Angostura bitters are optional. James Pimm’s fruit and gin liqueur was first made in 1823 and has since become part of the UK’s drinking furniture. However, as subsequent owners have systematically downgraded the abv of the liqueur which forms the base of the broader cocktail, it has fallen a little out of the premium space of bartenders’ thinking. In The PDT Cocktail Book, Jim Meehan makes his with Pimm’s No.1 Cup, lemon juice, simple syrup and muddled cucumber slices, topped with ginger ale. days are children of the gin house pour, which at the world’s best bars is most likely to be Tanqueray or Beefeater. Traditionalists insist the original recipe called for Old Tom gin (hence the name) and at Beaufort Bar, in this year’s World’s 50 Best Bars, the ’tenders have been known to use Jensen’s Old Tom as the principal part of their Tom Collins recipe. This sweet-hearted Manhattan – named after New Orleans’ French quarter, debuts this year. Thirteen per cent of our 100 bars said it was among their best sellers this time out, but none name it a top seller. So how do you make it? Well let’s take you back in time. Not to the ’30s when it was invented by Walter Bergeron, head bartender at the now Monteleone hotel bar in New Orleans, but to 2013, when Artesian was knocking out its own version. A heady mix of Rémy Martin, vermouth, Pikesville rye whiskey and Benedictine, plus dashes of Angostura and Peychauds bitters, presented in the way you would expect from Artesian. Somewhere between cool and uncool lives the Piña Colada. And sometimes, like now, it is both at once. You will find it in the best bars in the world – 14% in our poll name it among their top 10 – and the worst bars in the world. Piña Colada means ‘strained pineapple’ and harks back to the first rendezvous between pineapples and rum. Coconut then at some stage got in on the action in what is the vaguest history of anything ever written. For a spin on the classic, try Maison Premiere’s twist with absinthe and crème de menthe. It’s a first outing along the top 50 boulevard for the Boulevardier, which was found to be a top-10 cocktail in 14% of the world’s best bars. It’s simple to make – see the Negroni recipe and sub in American whiskey for gin. The choice which faces many a cocktail aficionado is whether it be rye or bourbon. We prefer the peppery, more jagged tone of rye. Invented by the ex-Milk & Honey and now Attaboy (11th in The World’s 50 Best Bars 2015) owner Sam Ross, this drink uses blended scotch, lemon juice, honey-ginger syrup and Islay scotch and is garnished with candied ginger. Credit where credit’s due, very few bartenders of the modern era have created cocktails considered classics. This medicinal, mould-inspired drink is firmly in that mould. The ultimate hangover cure is the Corpse Reviver, though there is scarce evidence it has sprung dead people into animation. The drink dates back to Harry Craddock’s early 20th-century Savoy Cocktail Book, when it seems people of fiscal freedom were hungover a lot. There are many versions but the original is cognac, calvados and sweet vermouth, stirred with ice and strained into a cocktail glass. Craddock recommends you drink one before 11am. Once you’ve refrigerated the Julep tin for so long it’s colder than the fridge, the drink is almost done. Just add mint, sugar and bourbon and there you have it. At the Kentucky Derby the Mint Julep is the no.1 cocktail, but at 100 elite bars we asked, not one said it was their no.1 classic serve.